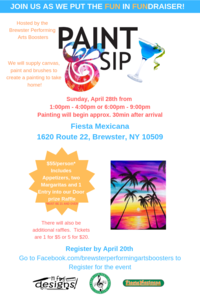 Paint & Sip - Adults Only! Create a work of art while having fun with your friends! Painting will begin approximately 30min. after start time. We will supply canvas, paint and brushes to create a painting to take home! $55/person - Includes Appetizers and two Margaritas (Must be 21+. ID Required) and 1 entry into our door prize raffle. Additional Raffle tickets can be purchased 1 for $5 or 5 for $20.